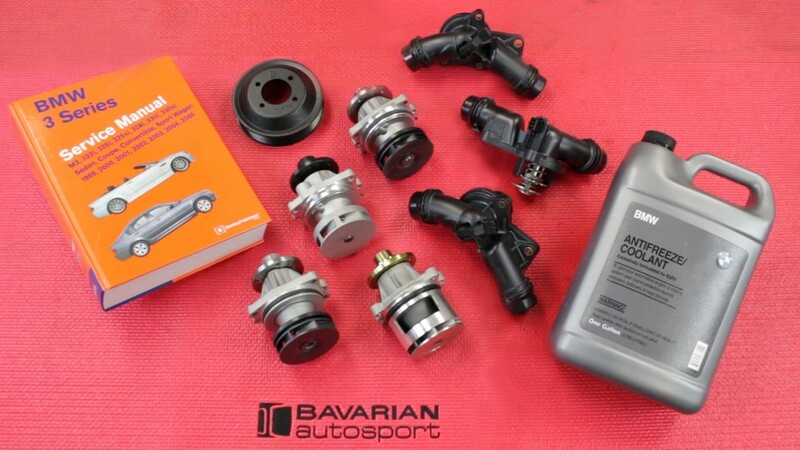 The Bavarian Autosport Ultimate Maintenance Schedule (blog.bavauto.com/go/maintenance) is invaluable for BMW and MINI owners who wish to do all they can to keep their Ultimate Driving machines in top shape. At BavAuto, we have been working on completing sample DIY videos for each of the maintenance tasks listed on the Ultimate Maintenance Schedule. In this DIY video we will cover the water pump and thermostat replacement on the BMW 24-valve 6-cylinder engines from the early ’90s through the mid 2000s. These engines are known as the M50, M52, M52TU, M54, M56, S50 and S52. BMW and MINI water pumps don’t last forever! Big surprise, but it is true, and not just for BMW and MINI. Water pumps will eventually fail and when they do it can be an inconvenience, at best, and a major catastrophe at worst. One of the problems with BMW and MINI water pumps is that they do not always give an early warning of impending failure. In these cases, you will be in need of a tow (possibly at the most inconvenient time or place) and, potentially, in need of major engine repair. This is why BavAuto recommends periodic replacement of the water pump …. before it fails. This video will show the specific water pump and thermostat replacement for the M54 engine in an E46 3-series (99-05). The general steps will be the same or similar for all 3, 5, X and Z models that use the M50 through S52 engines, as noted above. In the Fall 2013 issue of Fast Times we showed the DIY replacement of a common late model BMW electric water pump and thermostat. (Click HERE for Electric Water pump DIY). In this DIY video we will cover the very common later model 6-cylinder engines. While some details will vary depending on the specific BMW model, this DIY water pump and thermostat replacement will apply to the 6-cylinder engines (M50, M52, M52TU, M54, M56, S50, S52) in most 3-series from 1992 through 2005, 5-series 91 through 05 and the X and Z series through the mid-late 2000s. In most cases, the majority, if not all, of the work in replacing the water pump and thermostat can be accomplished from under the hood. We do recommend draining the coolant from the engine block before removing the thermostat or water pump. While this does require getting under the car, in most cases, it does provide a neater way to drain the coolant from the engine as opposed to having it gush from the water pump mounting recess as the pump is removed. Just an FYI; the link for the “metal water pump pulley” brings you to the Power Steering Pulley – Aluminium – Uro (32 42 1 740858M) in the on-line catalog. Thank you, Ross. Now fixed.